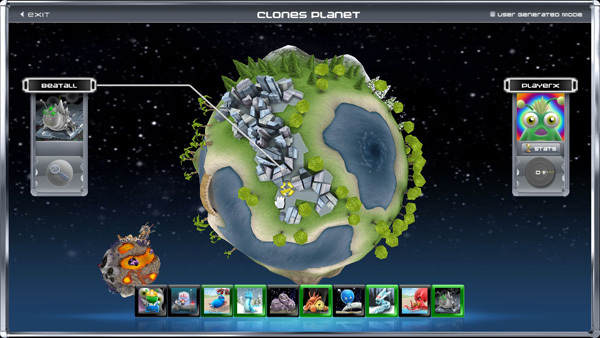 Clones is a friendly, fun, and engaging evolution to the classic Lemmings puzzle genre which includes robust internet-multiplayer with team play, different game modes, powerups, leaderboards, and a built-in level editor that was used to create the singleplayer campaign of over 150 clontastic puzzles spanning 11 CloneMaster bosses over 5 regions of the Clones Planet. Developed by gamers, for gamers. Client Free. 5% back on every purchase. Buy with your Blue Coins! "Whether or not you take advantage of all the extras, the core single player experience is well worth both your time and your money." "Clones [is] a highly recommended title for puzzle enthusiasts at a very reasonable price." "Im keeping my eye on Clones because it's so much fun to play." "Clones is a rather lovely Lemmings-inspired puzzler." "The single player gets you thinking and the multi-player puts it into full fast paced action." A ClonesGame.com account is optional, but highly recommended for leaderboard participation. Click here to register or login. Enjoy playing Clones? You feel that you're getting more value than what you paid for? You want to help us improve the game? All donations help! We worked many years to bring this game to life! The Intergalactic CloneMaster Organization welcomes you! Take the scenic route and solve the fun and challenging problems crafted by the most cunning creatures in the universe then try the competitive route and test out your strategies head-to-head, in real-time, against other players around the galaxy! Guide your clones as you explore over 150 perplexing puzzles on your pilgrimage across the Clones Planet to learn from the clever and quirky CloneMasters. Truly a thing of wonder, the clone's body has the remarkable ability of morphing into many different shapes to perform various actions. As a CloneMaster you must instruct each Clone when to perform a morph to overcome any obstacles. By defeating the Elder CloneMasters in one-on-one matches you will piece together the ancient CloneMaster Medallion and reveal a most formidable opponent. Enjoy the thrill as you outwit your opponents during online play and witness the glory as you sneak out a clone on a successful sabotage mission, or admit defeat as your squad of clones is secretly stolen due to marvelous misdirection! Team up with friends and play co-op in any of the over 50 multiplayer levels, or create your own using the built-in level editor. Custom levels are automatically shared when a new player joins your server. Puzzles Galore: With over 150 unique singleplayer puzzles presented by 11 zany CloneMasters spread across 5 environmental themes, Clones will provide you with many hours of mind bending fun! Pack a lunch. Multiplayer Mania: Support for up to 16 players in 8 colorful groups. Experience intense real-time strategy at its best by using the built-in server browser to find a LAN or internet match. In-game chats help you co-ordinate with your team and confuse your opponent! Spectators can watch matches without participating to study your mad skills. Customization: Use your creativity and the avatar creator to generate your own personal clone avatar by arranging the hair, antlers, eyes, body, and mouth any way you want! Easily tweak multiplayer level settings on the fly to adjust morph counts and play with dozens or thousands of clones, if you can handle it. Player Friendly: Per-puzzle checkpoints can be set at any time, preventing the frustration of having to start all over again on the tricky levels we've carefully prepared. Mini-map lets you quickly navigate, and warnings sound when your clones are in trouble. No Fillers: We know your time is important. Each and every level in Clones is different and presents a unique puzzle concept. We've worked hard to make the Clones experience as smooth as possible in every way. Bonus Items: Unlock stamps, decorations, and hidden levels as you progress. Use decorations to customize your clones in action, and use stamps to tag the terrain and taunt your opponents in multiplayer! CloneStats Ranking: Prove you have the quickest mind on the block with CloneStats world ranking system which includes detailed per-puzzle leaderboards and a chess-inspired multiplayer ranking system. Match Playbacks: Each game session is automatically recorded so you can share your solutions with others, or record a video of your epic multiplayer victory for all to see!